Central Texas is famous for hot weather days filled with blazing sunlight and temperatures repeatedly above 100 degrees. As Fall arrives and brings a few months of blissful peace from that, it’s no wonder that this is the time people most want to spend outdoors. With the end of summer in sight, now is the time to prepare a space for you and your dear ones to enjoy the weather change outside. 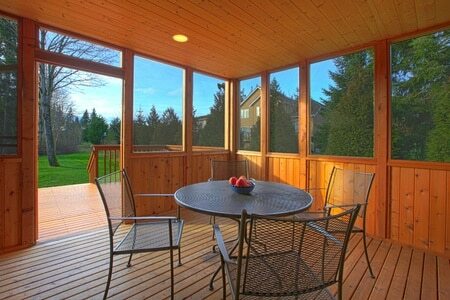 Whether you are considering investing in a new screened in porch this year, or simply interested in maintaining a pre-established one, we have some recommendations that should help make the space cozy and fabulous just in time for the weather change. There are many reasons your screens may have seen better days. Wear and tear from our regular wet/dry cycles are an obvious culprit, but there are some issues that speed up the aging process for screens. Hail can pack a wallop. Kids and pets can often be singled out for damage to screens. Tree limbs and plants can tear holes in screens. Once the screen is damaged, you may think it is imperative to go ahead and commit to replacing the whole screen. However, sometimes it is possible to repair screens. Our team will assess the damage and make sure to steer you in the right direction. Similarly, rough use, overuse, or even regular use does not automatically mean that a porch door, or storm door, needs to be replaced. Depending on what the issue is, we will come up with the best plan to address the problems with an older patio door and repair when we can. There are many times that a replacement makes the most sense. We have access to some of the best storm and patio doors available on the market today and only deal with quality products that we feel comfortable repairing and replacing parts down the road, making sure you get the most out of your investment. Starting from scratch? No problem. Our screened in porch specialists will help you every step of the way design and implement a fabulous screened in outdoor space for you and your family to enjoy. Our designs are created to increase the general appeal of your home and maximize the functionality of the space you are working with. Now’s the perfect time to build a porch for you and yours to enjoy for the rest of the cool season in the Austin area. It’s lovely to be able to open your windows to let the fall air into your home- but with an abundance of bugs out there, you may not want to without screens. Now’s a great time to evaluate the condition of your screens, have missing ones replaced and repair tears where needed. You can send us measurements for new screens, bring in your old screens for rescreening, or we can come out to you and minimize the hassle. If you are looking for additional energy savings, full solar screens are a great option. While it’s true that the Fall season doesn’t usually last a full three months in Central Texas, it does always seem to roll around in time for the holidays. Amidst all the pumpkin carving and pie making for Halloween and Thanksgiving, Autumn has a special way of reminding us to take time with our close friends and family. Those cooler Fall days are such a treat for us who are so used to the hot sun, so enjoying that cool Autumn air is preferable. Highly functioning storm, patio doors, window screens and a well kept screened porch will help you and yours enjoy a Texas Autumn to the fullest.